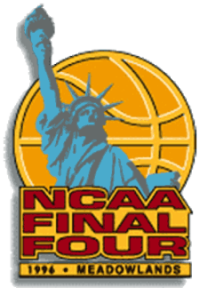 The 1996 NCAA Men's Division I Basketball Tournament involved 64 schools playing in single-elimination play to determine the national champion of men's NCAA Division I college basketball. It began on March 14, 1996, and ended with the championship game on April 1 at Continental Airlines Arena in the Meadowlands Sports Complex in East Rutherford, New Jersey. A total of 63 games were played. This marked the first time that the NCAA finals had been held in Greater New York since 1950. This was also the last (men's) Final Four to be held in a basketball/hockey-specific facility. Every Final Four since has been held in a domed stadium (usually built for football) because of NCAA venue capacity requirements. Therefore, this was also the last time the NCAA finals have been held in the Greater New York area (for the time being). Kentucky, coached by Rick Pitino, won the national title with a 76–67 victory in the final game over Syracuse, coached by Jim Boeheim. Tony Delk of Kentucky was named the tournament's Most Outstanding Player. Kentucky's run to the championship was one of the most dominant in NCAA tournament history, as the Wildcats won each of their first four games by at least 20 points and won every game by at least 7 points. The committee that put together the bracket in 1996 was criticized for placing what clearly seemed to be the best two teams in college basketball - UMass and Kentucky - on the same side of the bracket so that they faced each other in the national semifinal - not the final game itself. UConn, coached by Jim Calhoun and UMass, coached by John Calipari, were later stripped of their wins, including UMass' final four appearance by the NCAA because a player had accepted illegal gifts from agents. Head coach Rick Pitino helped Kentucky end its 18-year NCAA title drought by collecting the sixth crown in school history with a 76-67 victory over Syracuse. With the Final Four returning to the Greater New York area for the first time in nearly half a century, Kentucky guard Tony Delk was named the Most Outstanding Player.